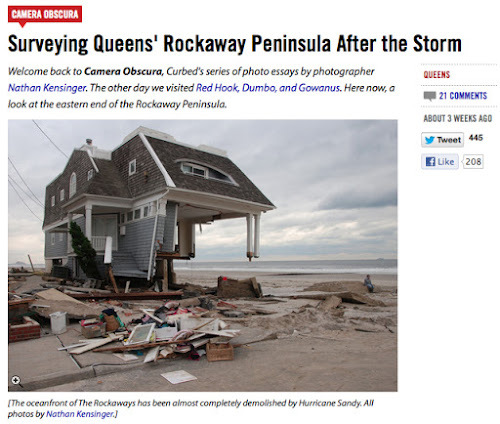 Three weeks ago, Hurricane Sandy landed in New York, causing enormous devastation to the city's waterfront. Many of the unique neighborhoods documented on this website in the past five years were flooded or destroyed by the storm. During the past three weeks, the website Curbed published a series of my photo essays documenting the storm's impact. This ongoing series includes post-storm surveys of damage in Gowanus, Red Hook and Dumbo (10/30/12), the Far Rockaways (11/2/12), Staten Island (11/5/12) and the cleanup in the Rockaways (11/19/12). These photo essays are part of my ongoing column for Curbed, titled Camera Obscura. A longer photo essay examining the storm's impact - titled After The Storm - was published on this website in December 2012.